A nest of tables is essential where space is at a premium. All our ranges feature one, so you'll always find one to match your style. Designed to complement each range in our collection, our nest of tables are a versatile, space-saving solution your home. 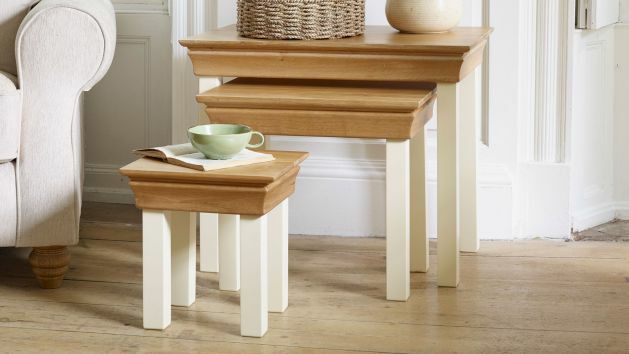 Discover solid oak, painted hardwood, and exotic mango table nests at Oak Furnitureland. Whether you need some makeshift tables for snacks and drinks when your living room is full of guests, or somewhere stylish for your reading light to sit, a nest of tables is a versatile, space-saving option. Built from supreme cuts of solid oak, painted hardwood and exotic mango wood, our nest of tables will bring cohesive style to your home. Give your interior design an abstract twist with a cube table nest made from chunky cuts of exotic mango or solid natural oak. Make a statement with a design that makes use of clean lines and geometric shapes. Incorporate a modern, cubed design with a nest of table from the oakdale or Mantis Light range. Balancing edgy shapes with soft wood oak, you can bring the perfect blend of classic and modern into your living room. Use nest tables to store away items or create an abstract space where you can display plants or ornaments. Bring classic design into your home with a vintage-inspired nest of tables set. Look for antique-effect pieces – tables with a dark wood grain such as those in the Cranbrook range have an elegant appeal, while a set of painted nest of tables can bring country cottage charm to your layout. Ideal for storing living room essentials, such as spare magazines and remote controls, a nest of tables is also incredibly useful for when you have guests around. Stack them out of place when you don’t need them and bring them out to hold glasses and snacks when your living room is full of friends and family. Take advantage of free home delivery for your nest of tables – our friendly drivers will even give you a quick courtesy call when they are close to your home, before delivering your furniture to the room of your choice. Our flexible finance options allow you to split the cost of your purchase into affordable monthly payments – find out more.